The average cost of back-to-school suppliesExternal Website totals $685, according to the National Retail Federation, and depending on your child’s age and needs, your costs could be higher or lower. 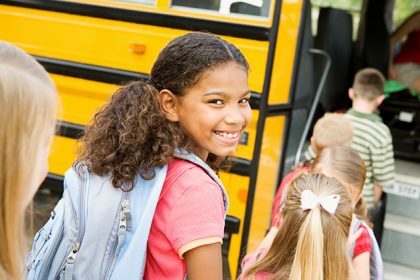 This year, we have several tips to help you save money as you send all your elementary, high school or college kids back to school in style. Kids quickly outgrow their clothing, but check your child’s closet before you purchase new clothes, uniforms and shoes. Make a specific list of clothing items your child needs, including sizes, so you only purchase the essentials. When you’re ready to shop, consider buying gently used clothing from yard sales and consignment and thrift stores or participate in the school’s uniform exchange program. You will also save money by purchasing the essentials now and buying the rest in September and October when clothing is deeply discounted. Inspect your child’s backpack from last year because it might be in good enough condition to use again. Replace a worn, torn or outdated backpack with a new one. Check store flyers for backpack sales. You can also find store coupons online or sign up for store emails, and use the coupon you receive in your email inbox to save money on a new backpack. Before you purchase everything on your child’s school supply list, gather all the pencils, notebooks, scissors and erasers you already own. You may have enough supplies to last the whole year! If you do need supplies, make a list and stick to it. Browse store flyers to compare prices, and purchase items only when they’re on sale. Or, shop at a store that offers price matching and save money without driving all around town. While a single Advanced Placement or college textbook can cost hundreds of dollars, your child may save money with three strategies. Purchase secondhand textbooks from students who took the class already. Rent textbooks at a savings of up to 90 percent. Use an older and more affordable edition if the professor OKs it. Stock your child’s college dorm room with cozy furniture and supplies like a mini-fridge, toaster or rugs without breaking the bank. First, make a list of the dorm room items your child needs. Verify if the college provides a desk and chair, rents mini-fridges or bans toasters. Check with your child’s roommate, too, to avoid stocking the room with duplicate items. Then raid your linen closet for spare towels, toiletries, lamps and a comforter. Finally, review sales flyers and buy essentials when they’re on sale or check out the furniture selection at local secondhand stores. Big-ticket items like laptops, tablets and printers are expensive, so look for coupons and compare prices. You may save hundreds of dollars simply by shopping online or at a store across town. Look for refurbished electronic devices, too, and spend less without sacrificing quality. Additionally, ask your favorite office supply store if they offer a discount when you recycle old electronics as you save money on the upgraded devices your child needs. This year, you can cut your back-to-school costs when you implement these tips. They save you money and equip your child for success in the classroom.